Florida is no stranger to hurricanes and tropical storms. Hurricane Michael is currently an active hurricane that is headed toward Florida, particularly toward the panhandle area. Currently the hurricane is expected to make landfall around Wednesday afternoon, bringing heavy winds and large amounts of rain. The hurricane is currently on the path to hit the northeastern Gulf Coast area of Florida, but will still bring rain and winds to the Central Florida area. There are no hurricane warnings issues for Orlando at this time, but Walt Disney World can expect winds and a lot of rain. If you will be at Walt Disney World this week then be sure to plan ahead for the weather. Disney will be actively monitoring the storm and will take any necessary action in order to keep guests safe. Disney has only closed the theme parks in a handful of occasions, but will make the call to close the parks if that is what is needed to ensure guest safety. Don’t get down about a rainy day in the parks! There are a ton of activities and experiences that guests can enjoy during the rain. 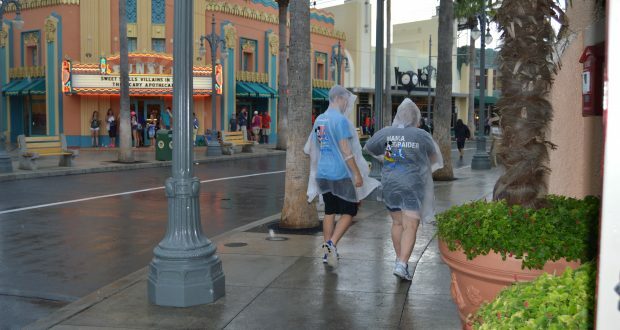 The rain can also clear some guests out of the parks, so you may be able to enjoy fewer crowds on a rainy day. Be sure to bring a poncho or umbrella, or you can purchase one there! While a rainy day can still be a great day at Disney, be sure to keep an eye on the weather and follow the directions of the cast members. We will keep you posted as we learn more about the storm and any impacts to Walt Disney World.